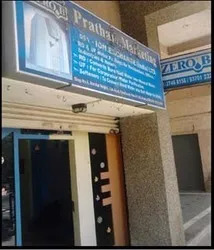 Established in the year 2001, “Pratham Marketing” is a prime name in the markets. We are engaged in Manufacturing, Supplying, Distributing and Trading a wide array of Water Purifiers. These products are manufactured by our trusted vendors. A team of quality auditors assists us in conducting variegated tests at our associates' premises to help us in procuring quality range of products. We have founded a State-of-the-art warehousing facility that assists us in safe and arranged storage of our procured products. This facility is designed in a manner, so that to accommodate products in specific categories by placing in rows and columns. This well-segregation of the place helps our warehousing executives in easy placement and retrieval of the goods. Also, we are capable to meet the bulk requirements of the clients in the due time. Our mentor, 'Mr. R. D. Suryavanshi', possesses rich experience, in-depth domain knowledge and business ethics, which motivates us in every business operation and guides to offer genuine products to the customers. His business acumen has been a grate contributor in the major success of our organization. Being a quality-oriented organization, we understand the responsibility to offer quality assured products in the market. Also, we work hard to meet client’s requirement by going extent. We value all the clients who are associated with us convey the same, to our associated vendors and offer products after proper quality testing. Our professionals believe in “Best Survives” policy and hence testify products with the set quality parameters to satisfy clients-concerns. We share this commitment to of offering superior quality products. Further, we have devised proper quality checking equipment at our premises. The team of dexterous quality auditors stringently inspects each stage at vendors' end on the industry set parameters. 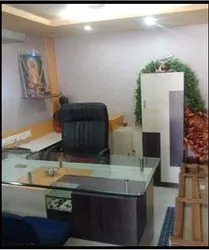 We have a well-established warehousing setup in Pune, Maharashtra that is spread across a sprawling area and has apt storage and administrative facilities. This capacious unit is developed to store all the products with utmost safety and streamlining the entire incoming and outgoing inventory. Also, the team of experienced warehousing executives possesses in-depth domain knowledge to achieve the desired objective of the organization. Our professionals work hard to ensure maximum use of the provided space for sequential storage. These professionals also keep the goods in the manner, so that the products remain ready for delivery at the earliest. These products are well-established in the markets for their optimum performance in water purification. Procured from authentic vendors, the products have all capabilities to remove chemical, physical and micro-organism impurities. Also, these products remove contaminations with 99.99% purity to keep user healthy and fresh. These products have a dual process to ensure maximum removal rates, ion exchange and sub micron filtering to achieve the highest purity of water and leave in the essential trace mineral that are meant to benefit health and well-being. We have engaged the domain experts of various areas and they support us in the task of meeting the clients' requirements. These professionals have in-depth knowledge and years of experience in procurement of quality assured products. The extensive process of vendor selection undertaken by these professionals, help us in hosting the individualistic demands of the clients. The experienced team of quality auditors check the quality of the products using advanced machines and tools on the set parameters, Endorsed by the skills and expertise of the teams, we are able to achieve success and earn repute in the market. Cater to the needs of utmost quality products of the clients, we have associated highly renowned and reputed vendor base for procurement of the products. Our vendors share the vision of stay ahead, and to do so, we maintain a genuine adherence towards our goods. The vendors have been selected after doing an extensive market survey with the support of the professionals. These professionals pursue set parameters for vendor selection. 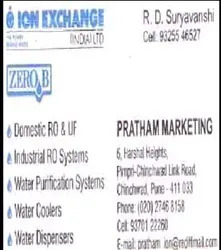 After confirming their market goodwill, ability to deliver bulk consignments, products' quality, manufacturing facilities and client orientation, we have established a long-run business association with ION Exchange Pvt. Ltd (Zero B) & Water Solutions for offering our product range. We value our clients as the most important part of our business. The team of professionals, working as a single unit, strives to cater to the exact requirements and further convey the same to the vendors. Also, we keep close vigil on the quality of raw material used for product manufacturing and, this way, we are able to earn a huge base of trusted clientele. To ratify the faith of clients with ease, we provide end-to-end purifiers at reasonable prices. Besides, we have a well-knitted network as well, depending on which, making timely deliveries of the consignments at clients' end. The determination and dedication of our organization has been highly appreciated by the customers. We hold our distinct identity, gained after trading a wide range of quality-assured Water Purifiers. For the same, we never compromise with the quality of the products. Also, our vendors follow strict instruction with standard measures, on which we check the quality of the procured goods.